Following its world debut at last autumn’s Frankfurt Motor Show, the flurry of new arrivals at Renault continues this spring with the French marque’s new-look Twingo Renaultsport 133. Ordertring opens for the upgraded pocket-rocket on 2nd April, priced at £13,565 on-the-road. 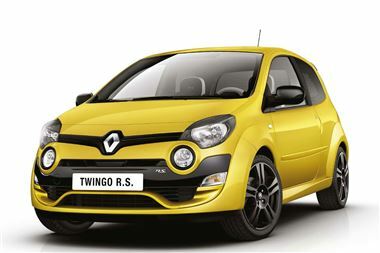 The changes to the facelifted Renaultsport version of Twingo are immediately apparent at the front, including the new Renault visual identity of its more humble sibling, combined with the added visual drama of a new dynamic grille design with four lights and a front bumper incorporating an F1-style blade. This detail, which now runs across the full Renaultsport range, alludes to Renault’s success in Formula 1. From the back, the Renaultsport Twingo has several model-specific additions including a black rear spoiler, a special rear bumper incorporating a diffuser and aerodynamic extensions on the rear wheel arches. On the inside, the performance aura of the flagship Twingo continues with Renaultsport yellow stitching on the steering wheel and seats, together with white detailing for the top of the steering wheel, seat backs and cushions, rev-counter surround and air conditioning controls. Aside from its new body-colour F1-style blade, core equipment on the latest revised Renaultsport includes 16” alloy wheels, Bluetooth™, cruise control, electric Gloss Black door mirrors, ESC (with on/off switch), speed limiter, extra tinted windows and tailgate, Renaultsport exhaust with chrome tailpipe, plus Twingo’s versatile independent sliding and folding rear seats. Several options are available on the baby of the Renaultsport range, among them 17” Anthracite or Gloss Black alloy wheels for £500, curtain airbags for £250, metallic paint at £460, or the even more striking Renaultsport Liquid Yellow i.d. paint for £1,300 (from end May 2012). The unique-in-class Renaultsport Monitor telemetry system is also available at a tempting £125. Given its already purposeful stance, just one exterior pack is offered – Anthracite Style – for the front blade, door mirrors covers and rear spoiler, priced at £150. Dieppe’s finest have chosen not to tinker with Twingo Renaultsport 133’s award-winning mechanicals, so its performance and grin-inducing driving characteristics remain intact. Its 1.6-litre naturally-aspirated powerplant still puts out a feisty 133hp at 6,750rpm, with 160Nm of torque available at 4,400rpm. Its top speed is a respectable 125 mph, with 0-62 mph dispatched in an impressive 8.7 seconds. Although the new range offers one version of the 133 with the standard Renaultsport chassis, an optional Cup chassis is still available for £700. The latter includes a ride height lowered by 4mm, stiffer springs and dampers, 17” Anthracite or Gloss Black alloy wheels and wider 205/40 R17 tyres than its predecessor. In keeping with its potency, Twingo Renaultsport 133 features plenty of stopping power, with 280mm-diameter front discs and 240mm-diameter rear discs. Despite its impressive performance credentials, the revised Twingo Renaultsport 133 boasts CO2 emissions of 150g/km, a saving of 3.2 per cent compared to its predecessor and improved fuel consumption of 43.5 mpg combined cycle, up by three per cent. Since its launch in September 2008, Twingo Renaultsport has emerged as a top-three seller in its class, with sales totalling more than 10,000 vehicles.